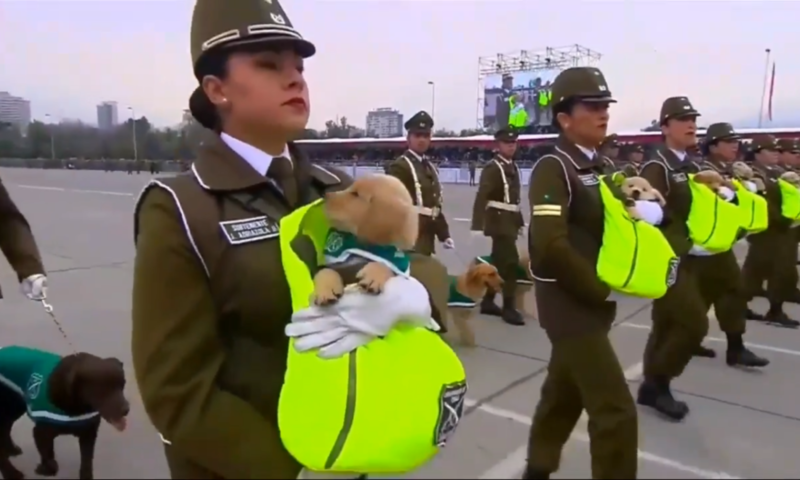 Chile’s annual military parade on Sept. 19 was overshadowed by an adorable puppy parade that went viral in major newspapers across the globe. The Glorias del Ejército is celebrated every year to commemorate Chilean soldiers who lost their lives protecting their country. This year, it also celebrated 50 years of the Chilean Armada and 200 years since the battle of Maipú, where South American rebels fought and won against Spanish royalists, gaining the independence of the Chilean region. This year, reported Defensa, almost 9,000 people took part in the parade from the Army, the Armada, the Air Force and the Police force (Carabineros). But the group that got the most attention was the parade of nine golden retriever puppies carried by police officers in yellow bags. The puppies, who were only 45 days old, form part of the Police Dog School of Training, and will be trained for police work when they are old enough, explained El Universo. They were also accompanied by full-grown German Shepherds and Labradors, who are used in the detection of drugs, explosives and missing people. 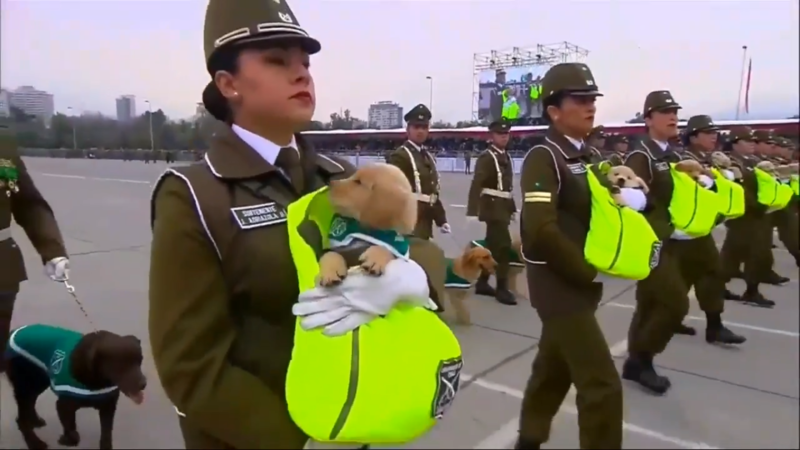 Although a very national affair, the puppy parade was covered by various international news outlets, such as Reuters and CNN from the United States, VDigital from Portugal, R7 from Brazil and the BBC from the United Kingdom. The video released by the BBC on Instagram received almost 60,000 likes, a testament both to the lovable pups and the UK’s deep-seated fondness of dogs. The parade took part in Santiago’s O’Higgins park, and was President Sebastián Piñera’s first Glorias del Ejército ceremony in office. Defensa reported that he admitted to feeling “a lot of emotion and a lot of pride” during the event. Mabel Sánchez also made history in this year’s parade as being the first time a woman commanded a company of cadets at the Military School.